When Do Hornets Come Out? What Kind of Birds Eat Bees? What Are the Benefits of Hornets? Classified under the biological genus Vespa, hornets are wasps that are closely related to yellow jackets. You'll find hornets across the world in North America, Europe and Africa, but the majority of these insects are found in tropical climates in Asia. There are 20 species of hornets, and while most people view hornets as pests with a painful defensive sting, hornets benefit the ecosystem. Despite their venomous sting and sometimes intimidating size, hornets also offer important benefits in their local ecosystem: They control arachnid and insect pests, and they pollinate flowers as they travel from plant to plant. Hornets are social insects, living in communities called colonies. Their powerful, venomous sting causes allergic reactions in some people, and varieties like the giant hornet can grow to a startling, intimidating 1 1/8 inches long. In some cases hornets are even pests, harming fruit crops and trees as they collect sugar and sap. But they also serve an essential function in the ecosystem, which is why they're considered protected wildlife in places like Germany. In late summer, you're likely to find hornets around social areas and picnics, scavenging for food. Hornets are predators that serve a special function in controlling other populations of insects. Without hornets, insects like spiders, caterpillars, flies, crane flies and beetles would breed out of control and become a greater nuisance. Hornets control the populations of these pests by eating them – a perfect win-win for everyone except the insects being eaten. Like the honey bee, hornets serve an essential function to fruiting and flowering plants. As they travel from plant to plant hornets also pollinate the flowers. Without hornets pollination wouldn't occur at the same rate, stunting that year's growing cycle and affecting the food chain. 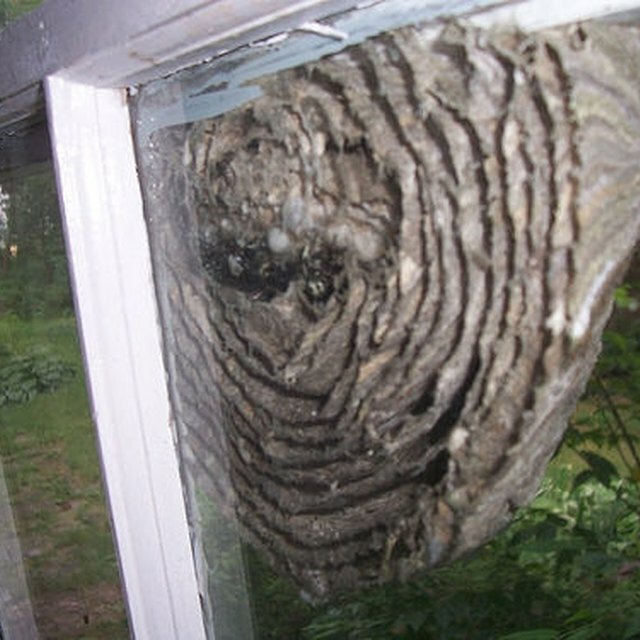 Despite their benefits to the ecosystem, hornets are still considered a hazardous pest when they make their homes in or around places where people work, live or play. When disturbed or provoked, hornets can become increasingly aggressive, causing a painful sting that may elicit an allergic reaction. However, controlling the hornet population is only necessary when hornets pose a direct threat to people or domestic animals. Hornets serve an important function, and should be left undisturbed unless they pose a direct threat. What Happens to Bees & Wasps at Night? Maier, Casandra. "What Are the Benefits of Hornets?" Sciencing, https://sciencing.com/benefits-hornets-8741480.html. 05 April 2018. How Do Wasps Make Their Nests?